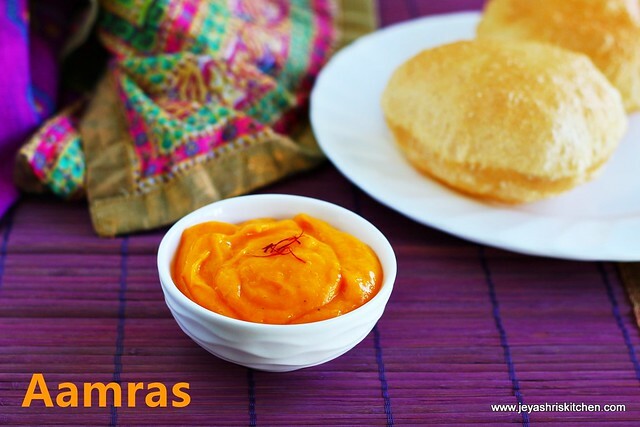 Aamras is a popular Maharastrian dish made with mangoes and other flavourful spices like elachi and saffron. I have tasted this many times in my friend's house as a dessert, but this is the first time i am making at home. Last week when i visited a friend she made dal baati and aamras for me. I thoroughly enjoyed the food and noted down the recipe of both. Will soon post the recipe of dal baati. 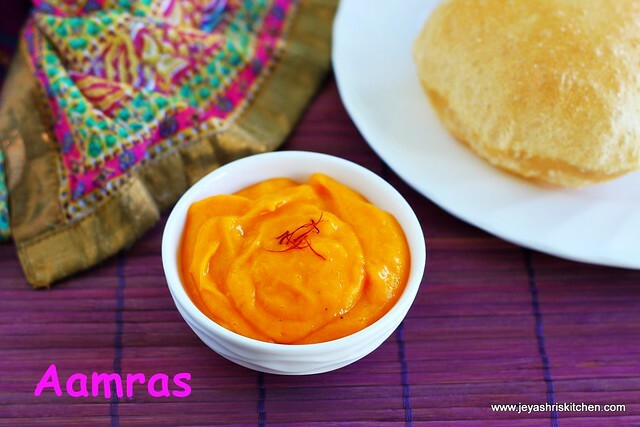 Today i made poori for breakfast and made this aamras too. Poori and aamras turned out to be good combo. Check out my other mango recipes. *You can use any variety of mango but alphonso mangoes are recommended. Wash the mangoes and peel the skin. Slice it roughly. In a mixer add the mangoes, sugar and milk and pulse till it becomes a fine puree. Add elachi powder to this and mix well. Garnish with saffron and serve chilled. Generally it is served with poori. Alphonso mangoes gives nice colour to the aamras, you can use any variety of ripe mango too. Instead of milk you can add fresh cream also. Adding sugar is optional. If the mango is sweet no need to add sugar. Hi jeyashi, you have such a wonderful blog with mouth watering recipes! Thanks to you I have learnt so much. This recipe is it a dessert? I'd love to try it as I'm a huge mango fan but I live in chennai and any idea what Alphonso mango is in Tamil? Because there's so many variety here I'm not sure which one will bring out this bright orange colour. Sorry for the delayed reply. Was on a vacation. You can very well serve this as a dessert. You can try with banganapalli also but for colour you can use neelam variety.